In a moment of beautiful serendipity, I sat down at my computer this morning, to start this post about my trip to New York. The shopping. The theatre. The art. And on CBC radio, Michael Enright began interviewing Ross King, discussing King’s new book Mad Enchantment, about Claude Monet and his famous water lily paintings. Two of which I just saw… like… three days ago! At Moma in New York. I love it when stuff like that happens, don’t you? But I’m getting ahead of myself here. Let’s begin at the beginning. Elizabeth and Sue went to New York. On a plane. They stayed four nights, and saw and did many exciting things. These are their stories. And pictures, of course. Glued to the window. Waiting for a view of the New York skyline. Elizabeth and I have been planning this trip for a few months. Getting together to eat lunch and talk about what we wanted to see, and what we didn’t give a toss about. Researching the best ways to travel and where to stay. Making lists of what we wanted to do. We decided to stay at the beautiful, historic Gregory Hotel on West 35th St. There was a bit of a glitch with our booking when we arrived on Monday. But that was solved, and the rate for our first night suitably reduced. I do admit to getting, ahem, a bit testy with the front desk clerk over that. But I calmed down and things were soon hunky dory. This is me, below, lounging on my bed in my Veronica Beard jacket. The Gregory is close to so much we wanted to see and do. So, for three and a half days we walked. And walked. The first afternoon and evening we found our bearings. Explored a few blocks in all directions from our hotel. Saw the first of many iconic landmarks. Ate Korean tapas at a nearby Korean Gastro Pub. Oh, yum. That was delicious. I even managed to use chopsticks without embarrassing myself. Thanks to my sister-in-law Yu Ling who taught me this skill many years ago. 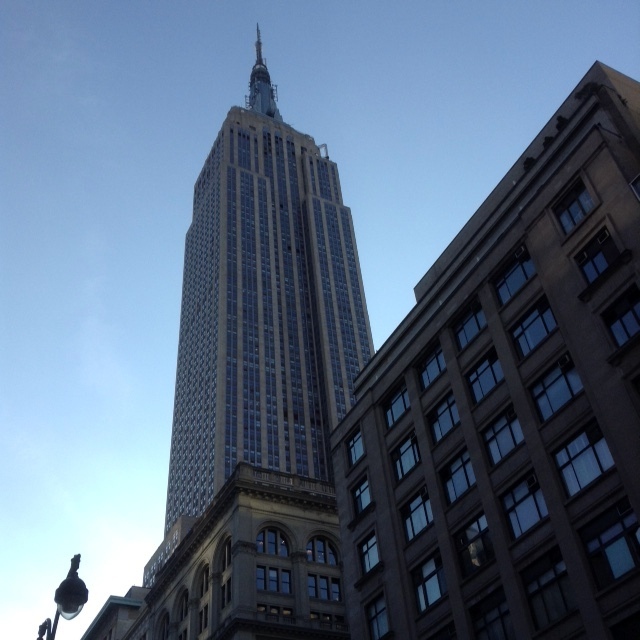 The Empire State Building was quite near our hotel. The next two days we hoofed it all over midtown and downtown. Somewhat shell shocked, I will say, by the crowds and the sensory overload. As Elizabeth said, “Too much much-ness” Love that line. 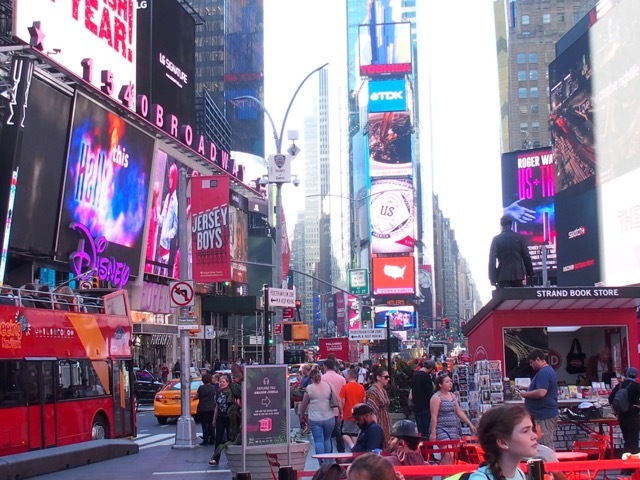 Times Square is definitely a far cry from Manotick on the Rideau, folks. 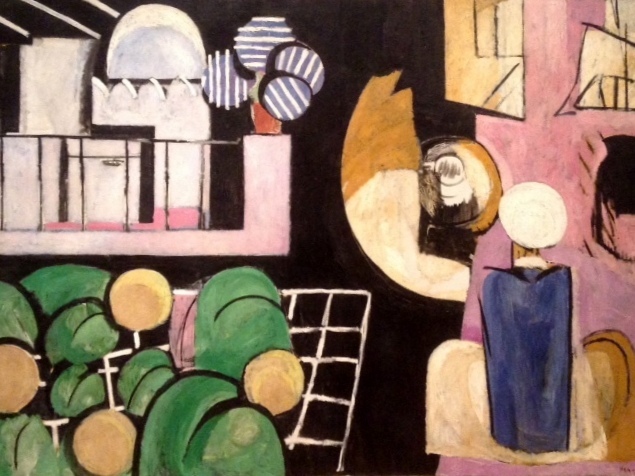 We spent a lovely afternoon at Moma, the Museum of Modern Art. Moma was on both our ‘must do’ lists. I love modern art, having been converted many years ago when I took my creative writing class on a field trip to the National Gallery here in Ottawa. I still smile at the memory of our “very cool” tour guide who kept me and 30+ initially bored and dismissive teenagers spellbound for over an hour. I don’t pretend to always understand what I’m looking at. But I’m always willing to be enlightened. 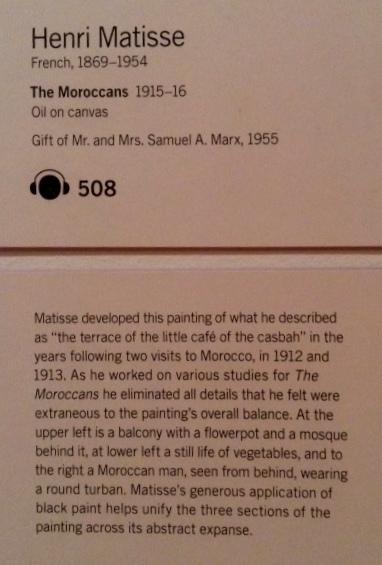 At Moma, the Matisse painting, below, began to unfold for me when I read the description. Ah, now I could see the flower pot on the balcony, the man in the round turban, seen from behind. Of course, we also saw lots of Picassos, stunning paintings by Andrew Wyeth, and those Monet water lilies that I mentioned above. And then after only two floors … we were done. Arted out, so to speak. We’d leave the rest for another visit. On our way back to the hotel from Moma we stopped for a quiet moment at Saint Patrick’s Cathedral on Fifth Avenue. Beautiful. 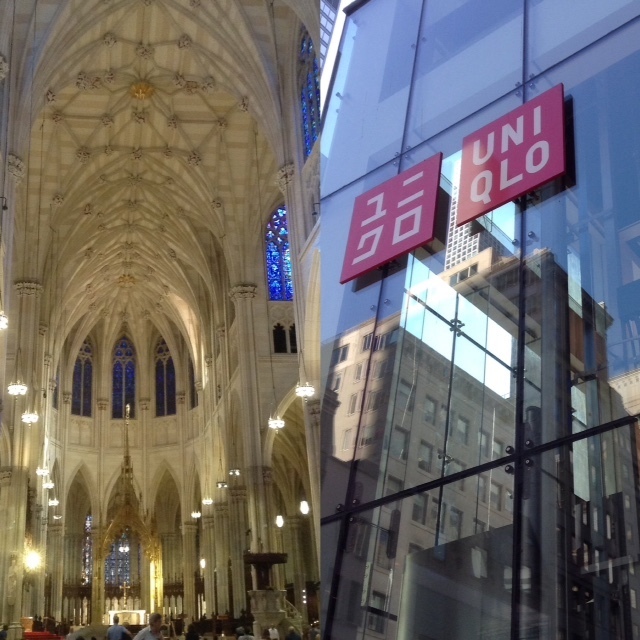 Then toured Uniqlo, a temple of a very different sort. So many sweaters; none of them suitable, as it turned out, for moi. We ended the afternoon at the New York Public Library. A gorgeous old building, and so wonderful that it belongs to the people of New York. The library… perfect end to a perfect day for an ex-English teacher and a retired editor, don’t you think? That night we were well able to handle a big meal, but not prepared to walk far to get it. So we dined in at Brendan’s Bar and Grill attached to our hotel, part of the original “public rooms” of the Gregory back in its heyday. Day two was largely dedicated to shopping. Now why doesn’t that surprise you? Caffeinated and coiffed we left the hotel early, hoofed it down Broadway, and ate our breakfast in the square under the shadow of the iconic Flatiron building. Then we pressed on, intent on shopping in Greenwich Village and Soho. We lost ourselves for a time among the “eighteen miles of books” in the Strand Bookstore. Experienced the strangely confusing decor at Prada on Broadway. Seriously, when we entered the store, the stairs looked as if they disappeared into thin air. We laughingly asked how to access the women’s clothes, and a staff member chuckled and kindly explained. In fact everyone was lovely; which kind of surprised both of us. We had expected haughty indifference. I had a hard time choosing a sweater: burgundy or military green? I also had a hard time opening the sliding door of my dressing room. For a moment or two I was trapped inside four walls of mirrors with a video screen of Prada-clad models, their hair softly blowing in the breeze. Totally surreal, almost Ray Bradbury-esque. Then we lunched in Soho. And on our way back to our hotel, we detoured through Washington Square Park, Henry James country. 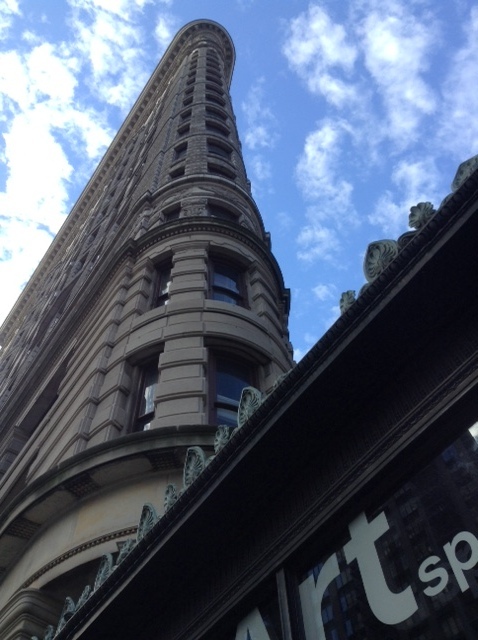 Books and clothes and literary landmarks. Oh my. My Stan Smith sneakers were steaming from the miles of pavement we’d covered. Day three started with a visit to Macy’s. I shopped, and tried on coats, and felt a little guilty as Elizabeth patiently held my purse. I found a fall coat that I loved, and which now resides in my closet. I’ll tell you the tale about that in a fashion post soon. 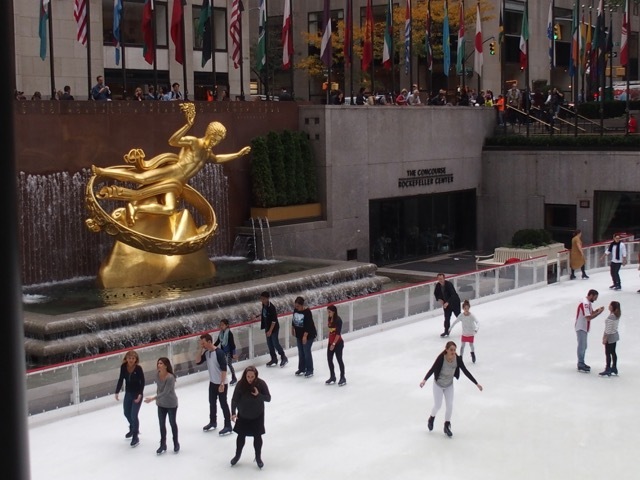 We stopped by Rockefeller Center to see the statue of Prometheus. And the ice skaters, of course. Not surprisingly the ice looked a little spongy after the recent heat wave. Then we purchased a take-out salad for supper and went back to the Gregory to put our feet up for a while. 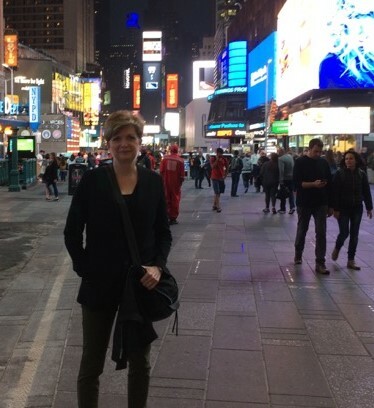 Elizabeth’s photo of me in Times Square on our way to the theatre. I grinned throughout the entire performance. And Elizabeth says I may have audibly “oh-ed” once or twice at the beginning of a particularly beloved song. It’s hard to keep quiet when you hear the first strains of a song you’ve sung every word to, for so many years. During the encore number the entire audience got to their feet and sang along. Sigh. Brought a tear to my eye. In another serendipitous moment, we discovered that the role of Carole King is now played by Canadian Chilina Kennedy, whom I saw in Evita at the Stratford Festival. Now how cool is that? New York at night is beautiful. We wended our way back to the hotel, as a mist descended. That’s the Empire State Building below. The top of it lost in the fog. Tomorrow the weather would change. And we’d head for home. Our journey home was not without its drama. Extra long cab ride to the airport courtesy of construction and lots and lots of rain. Weather delay, as well as broken-down ground equipment and some guy who had to get off the plane minutes before we were to take off, all meant that our flight out of LaGuardia was delayed by almost two hours. This ate up (pun intended) the time between flights in Toronto when we should have been able to get supper. It also meant a mad and frantic dash for our flight to Ottawa. And I do mean mad. Leaping to the front of the loooong security line after clearing customs. This upon the advice of the West Jet operator whom Elizabeth phoned as we languished in the huge line ten minutes before our flight. Then the dash to the gate as our names were called. Red faced, hair no doubt standing on end (well, mine anyway), filing to the back of the plane (of course) under the baleful gaze of people who had been waiting in their seats, and were probably wondering who the two airheads were who couldn’t get to their gate on time. Or at least that’s what I imagined they were thinking. Then, starving, we were offered those disgusting granola bars… again. I hate those. But I inhaled it anyway, thinking that hopefully Hubby would have something good to eat at home. And, of course, he did. So. Elizabeth and Sue went to New York. These were their stories. Well, some of them. We’ve already started talking about next year. I hear that Sally Field will be playing Amanda Wingfield in The Glass Menagerie. Oh. I adore Tennessee Williams. I’d give anything to see that. If you get a chance, you have to see Beautiful. I mean it. You’ll love it. Have a listen. Lovely stuff Sue . We are just about to set off to Barcelona airport & ' footsore ' & 'sensory over load ' rings true here – too much muchness indeed . Thoughts from your post – what a lovely smile Elizabeth has – Carole King , yes , I know all the words – beautiful sparkly lights of New York . Perhaps , like Barcelona , a few days is enough at that pace & now we can relax & remember . A few days is definitely enough. Now I'm reading up on some of the sights I've already seen and dreaming of next time. I wonder if Barcelona was hot at this time of year? We couldn't believe the heat wave in New York when we arrived. Totally played havoc with all my packing planning. No , not hot – max 22 . We don't do heat very well – tend to get bad tempered ! Wonderful!! What you packed into four days — so great! And now we're all curious to see what you packed into your suitcase. . .
Oh, that will be coming soon…although not at all exciting. Ha. Thanks for that…I corrected it first thing after I read your comment. I kept mispronouncing it too. Didn't know the "u" wasn't silent. You gotta love those local pronunciations. Here we have a place spelled "North Gower" and pronounced "North Gore." Oooh it sounds like so much fun! More details will be appreciated, especially about your new coat. Don't worry… it's coming. I couldn't resist writing about my new coat. Thanks, Alayne. Once the washing is done I'll be working on that one. And including my purchases…although there were only two. I loved reading about your New York adventures. I grew up in Connecticut and visited many times in my teens and twenties, and now our youngest daughter lives in Manhattan- she has been there for over 5 years now and I don't get to visit her nearly enough. I love the energy of the city and enjoy just walking everywhere. Saw "Beautiful" in London last January and the songs transported me back in time as well. Thanks, Pam. That musical was one of the best I've seen. Partly because although I love the songs of many musicals…the storylines can be a bit lame. I was so disappointed when I saw South Pacific a few years ago at the Stratford Festival. The songs and singing were great but the story… really bad, I thought. Sounds like a lovely trip! Thanks for sharing. Great pic of you on the bed in the jacket! I can thank Elizabeth for that. Hi Sue, really great post.I read it whilst in a ride queue at Disney ..in the dark! I was so engrossed I kept finding myself surrounded by strangers whist my husband and son were metres ahead, laughing! So glad you had such a fantastic time. You certainly had a fun filled few days! 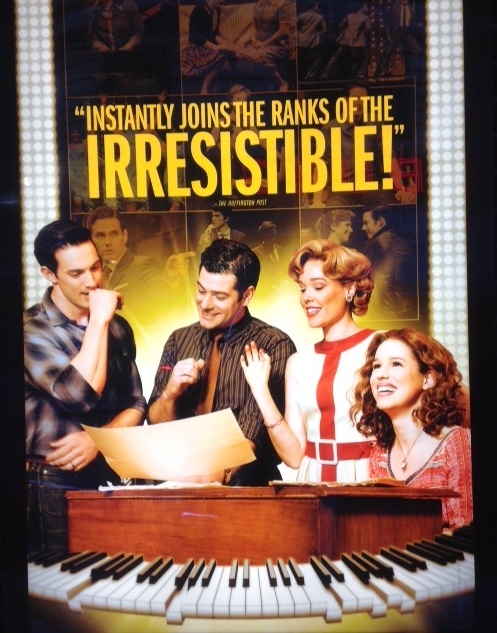 I can't wait to see the Carole King musical. Tapestry is one of my all time favourite albums.I love every track.Looking forward to seeing you model your new purchases.Have a good week! Hi, Rosie. I'll be posting about clothes later this week. Stu has been elbow deep in notes and guide books researching our trip to South American next year. Since I haven't even started doing any reading yet… and feeling guilty about that…I'll be doing some cramming for the next couple of days. Catching up and doing my bit. 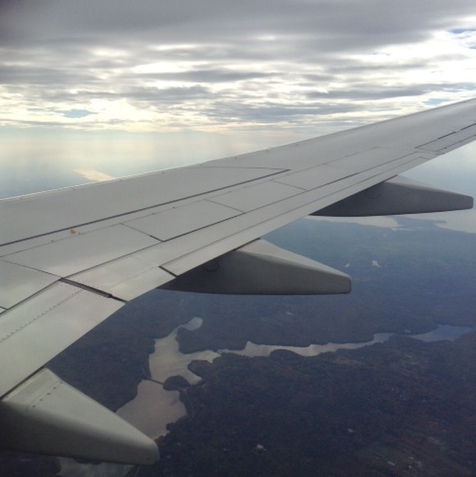 And speaking of travel…you have covered a lot of miles this year yourself. I guess you're in Florida now? Hope you are having fun. South America will be an amazing trip I'm sure …lots of research and prep I imagine. I want to go with you next year! lol What a wonderful adventure and what great photos! I absolutely love seeing a city on foot. 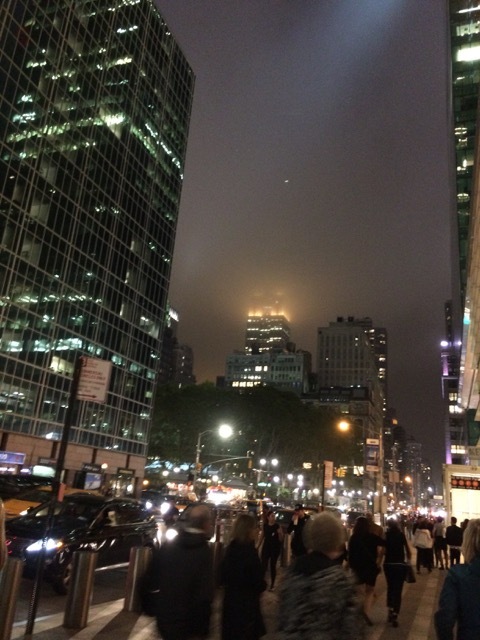 On foot is the best way to see a city… IMO. We had thought about doing one of those hop on, hop off tours but were glad we didn't when we keep seeing the buses just sitting in traffic not moving. That could eat up a lot of your day, I think. Too much much-ness or not,your post is full of sparkling happiness-great idea for your birthday! And great post! We became used to the "much-ness" after a day or so. But getting up the morning after I came home and sitting in my sun room with my tea, watching the rain and the ducks on the river, I was glad that I don't live full time surrounded by city. Sounds like you managed to squeeze in lots! I'm glad the weather was good. Thanks, Suzanne. It seems that we did a lot of things but we never felt rushed. Mostly a ton of walking. That's right, Jacqui. Those songs sure brought back memories. Great trip and wonderful photos. Love to know what kind of camera Elizabeth is using….I'm a painter but have been getting more and more interested in photography (using iPhone)…however, need more pixels for higher resolutions. HELP! if you would be so kind.